Contact with blood and body fluids is a serious risk at any trauma scene or death scene. Blood-borne pathogens such as Hepatitis B virus (HBV), Hepatitis C virus and Human Immunodeficiency Virus (HIV) may be present in blood or other potentially infectious body fluids. The dangers of a trauma scene increase greatly when sharps or glass are involved, placing workers and occupants at further risk of injury. Health and medical personnel are very aware of the dangers of contact with blood-borne pathogens, which is why they wear gloves and other personal protective equipment to avoid exposure. Occupational Health & Safety requirements prohibit employers from using staff to clean up workplace accidents that expose them to risks. 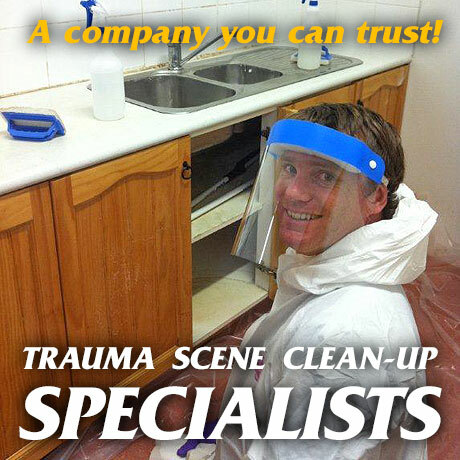 Mackay Crime & Trauma Scene Clean-Up are specialists in their field. We can test for contamination after our cleaning if required so that you know it is safe for occupancy. Invite us to help to restore your property or business after a major trauma incident.